1. My nail polish. It's Black Lingerie by Revlon. I've never worn black polish ever so this is very interesting for me. It's actually not black enough for me but I like that it dries fast and that it's really sticking to my nails. I also love those cute pudgy feet! 2. My nail polish again, this time on my toes. It's Raven Red also by Revlon. I love that gorgeous red! Sorry that you really can't see the polish. This photo was meant for an outfit post, which is up next. 3. Reading Margaret Atwood at the Ayala Triangle Gardens. I don't remember the last time I read a book under a tree! So today, while waiting for Vince's lunch break, I went to the park and read. Happiness! Since I grew up in the hills, I do miss fresh air. Now you can't say that the air in Makati is fresh but that little park does feel like an air purifier. I swear my lungs liked the air better there. 4. The Rustan's Home slippers that were provided at the La Mer facial I had this morning. These slippers are the best. Ever! I'm going to buy myself a pair. 5. Fruits. Nothing says summer quite like a bowl of fruit! 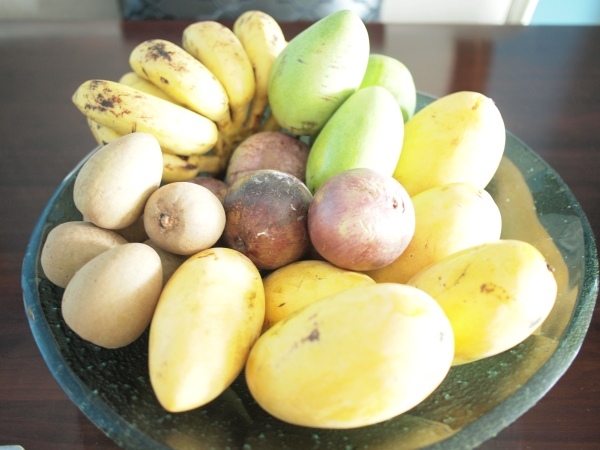 That's mangoes, star apple, chico and bananas. They're from my in laws, who are always so very generous and thoughtful. Actually, I am loving a LOT of stuff right now but I believe they deserve a post becuse they have such fabulous stories attached to them. Blog marathon tomorrow! Hitting the sack now to sleep between the hubby and the baby. And that is my ultimate favorite thing! Fabulous manicure! Your nails are so nicely shaped and I love the black polish. I love black nail polish! :) and those are cute pudgy feet!!! Kakagigil mga paa ng babies! I love that Black polish! and that baby feet is adorable. I'm a new follower, I hope you follow me back. Kelly, I'm going to blog about it soon in my beauty bog. Time to revive that blog!